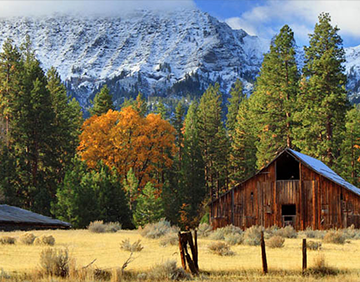 Siskiyou County is an authentic pocket of rural America filled with historic towns and stunning scenery. Hike with your dog along scenic vistas. Climb Mt. 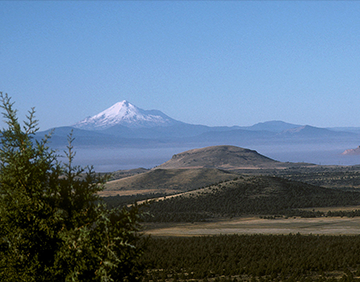 Shasta, the second highest volcano on the west coast. Backpack the Pacific Crest Trail and search for Bigfoot! Butte County is the thundering of 410-foot Feather Falls and a sip of Sierra Nevada brew straight from the source. It is the mystical hanging cascades at Phantom Falls and the buttery taste of olive oil from 100-year-old trees... and one of the most dog-friendly places in California. Tehama County lies midway between Sacramento and the Oregon border and offers the ultimate in healthful, leisurely living. 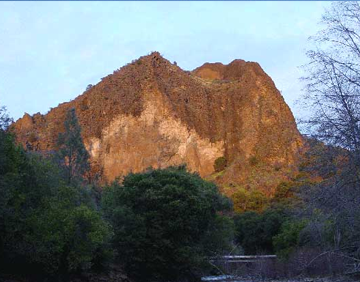 It is a central point of widespread recreational areas which provide hiking for you and your dog, camping, horseback riding, bicycling, boating, hunting and fishing. 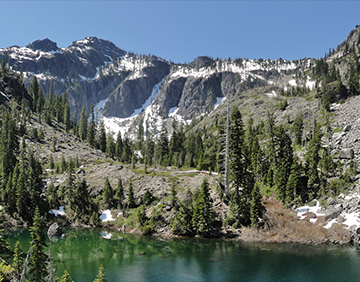 Lassen County is an outdoor paradise, where the beautiful Sierra Nevada and Cascade mountains meet the desert of the Great Basin. You can water ski or fish for the world-renowned trout at Eagle Lake, surrounded by mountains covered with standing pines. Winter visitors enjoy cross-country and downhill skiing areas, and snowshoe hikes in Lassen Volcanic National Park and Lassen National Forest. 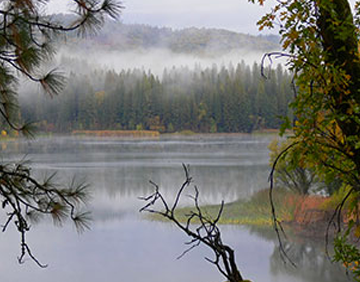 Plumas County is a four-season vacation destination. 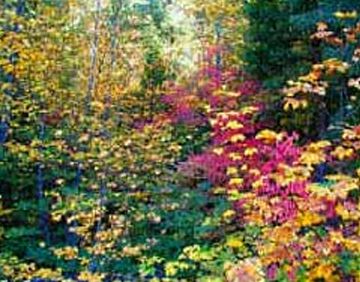 The fall color rivals Vermont and New Hampshire, the mountains are a great backgrop for winter snow activities, and in spring and summer there's lots of hiking and invitiing mountain lakes for you and your dog to explore. 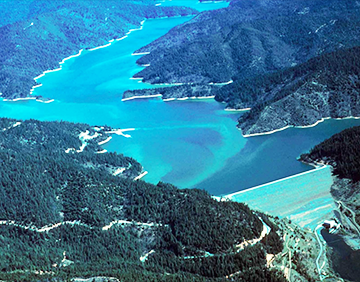 Lake Shasta, a popular destination for houseboaters, is California's second largest lake. Mount Shasta's magnificent colossus of four volcanic cones is visible from 110 miles away, and the peak is snow-capped even in summer. 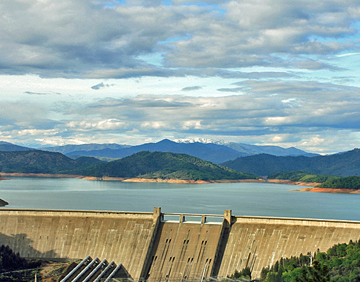 Redding, the jumping off point to the Shasta/Cascade region, is a DogTrekker paradise. 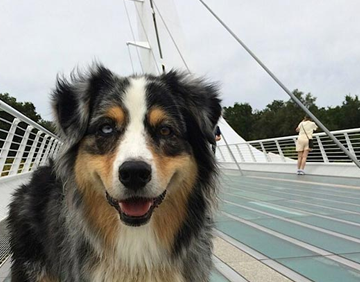 It’s home to Shasta Cascade’s most impressive manmade landmark, the Sundial Bridge that spans the Sacramento River and part of a 16-mile, dog-friendly paved trail that runs along the river from Redding to Shasta Dam. 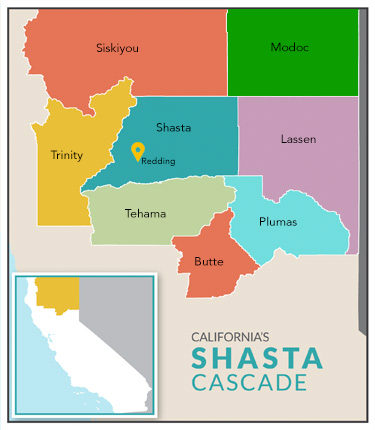 Northern California’s eight-county Shasta Cascade region is lean on population but incredibly rich in recreational opportunity. Seven national forests, three mountain ranges, a national park, a national monument, two national wilderness areas, 15 state parks, countless lakes, the city of Redding and some of the West’s most acclaimed fishing streams put the region high on the list of possibilities for outdoor-oriented vacationing with your dog. Dog-friendly hotels and resorts dot a region that encompasses Plumas, Lassen, Modoc, Tehama, Siskiyou, Trinity, Shasta and Butte counties.